Our Studio Program offers a variety of exciting and enriching after-school activities in which you may enroll your child monthly. Students from Toddler to Middle School have many options from which to choose, including art, swimming lessons, dance, crafts, computer, Girl Scouts, karate, Science Olympiad, intramural sports, chess, cooking, gymnastics, and music. All programs are designed to help busy parents by being offered at the end of the school day on campus, saving parents the need to drive to lessons in the evenings. Balance yoga classes are comprised of activities that are fun and upbeat as well as focused and relaxing with the goal of inspiring the following character traits: willingness, focus, determination, kindness, patience, confidence, and service. In each class children will practice poses, sequences, and yoga breathing in order to build strength, flexibility, coordination, and body-awareness. Our custom Balance Blueprint program helps children to monitor and track their progress in a non-competitive manner. Children will have a great time learning yoga basics through playful movement and games! Students will gain strength and flexibility and will learn breathing techniques to help calm their bodies and minds. 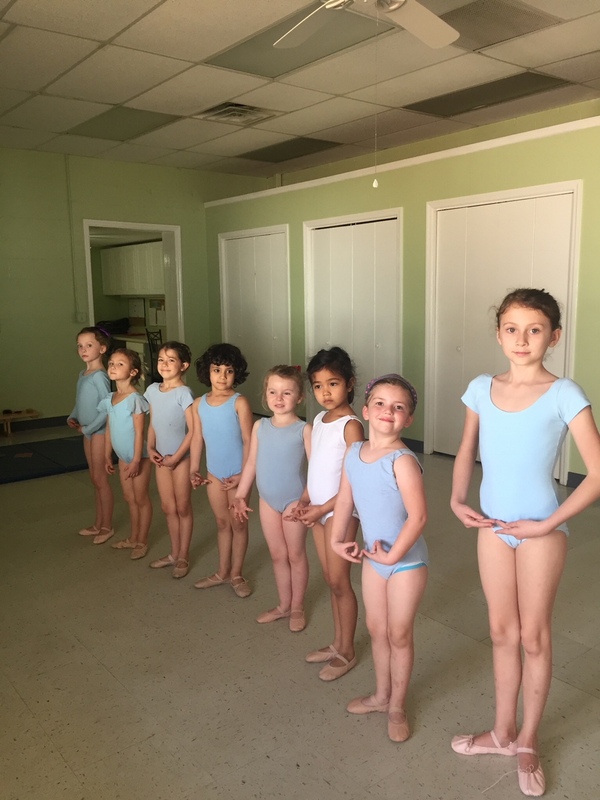 They will learn proper alignment for foundational poses, practice sun salutations, and explore a variety of relaxation techniques. Each series will focus on a social skill that will assist students in building self-confidence and awareness. An exciting foundation of basic ballet technique, vocabulary and terminology, ballet history, and ballet etiquette. Royal Academy of Dance syllabus provides technical base to foster a lifelong love for dance. For specific dress code requirements, please refer to confirmation letter. Joining the Montessori school for her 6th year, Sarah was born in Huntsville, Alabama and studied at the Briarwood Ballet in Birmingham. During her high school training, she attended the Houston Ballet, Ballet Magnificat! and American Ballet Theatre’s Summer Intensives. Sarah opted to home school her senior year of high school in order to dance as a Soloist for the Alabama ballet and danced there for two years. Her principal roles have included Dew Drop and Sugar Plum in the Nutcracker. Soloist roles in Roger Van Flettern’s Tickling the Ivories, Wes Chapman’s Dr. Jekyll and Mr. Hyde and Coppelia. Since 2000 she has performed as a Guest Artist nationally and internationally, trained and coached dancers, as well as set numerous choreography projects on many local schools and companies including Ballet Tennessee, Chattanooga School of Creative Arts, and Chattanooga Christian School. Her most recent adventures include opening SPOT Venue & Ballet Esprit in the Brainerd Arts District, fostering the passion of dancers and creatives of all ages. Sarah is a certified in Pilates, Yoga and Progressing Ballet Technique offering a strong foundation and holistic approach to dance education. Sarah celebrated her 20th year of teaching ballet this spring! ChessNinja teaches life skills through chess. Our students learn to stay calm, face challenges, and learn through experience. In class, we'll discover chess tactics and strategies through physically and mentally stimulating activities. Both complete beginners and seasoned veterans are welcome! ChessNinja introduces preschoolers to chess through body movement and storytelling. Along the way, we'll learn about the Growth Mindset and strategic problem solving. Computer Explorers TechStars program simplifies the complex world of educational technology by connecting Science, Technology, Engineering, Math, and the Arts. TechStars welcomes students into a progressive curriculum that begins with foundational skills that rapidly lead to advanced knowledge, exploring and developing new ideas, and creating hands-on projects in an educational setting designed to make learning FUN. All of our teachers are trained in the COMPUTER EXPLORERS methodology – including classroom etiquette and control and the basics of early childhood capabilities and learning as well as having an educationally correct (with scope and sequence) curricula which meets NETS standards. Please visit our website at www.computerexplorers.com for more information. Beginning students will learn basic navigation skills while continuing to familiarize themselves with the parts of the computer. They will become more comfortable with the computer while working on age appropriate educational programs. These programs range from colors and shapes to building math and reading skills. They will also work on such things as memory, strategic and critical thinking skills, deductive reasoning, and categorization. Individualized computer lessons. 30 minute class per week. *Class times determined according to student’s daily schedule by Area Director. Students will be working on a large range of educational programs geared to their level. They will build math, vocabulary, and reading skills. They will also work on such things as visual memory and discrimination, strategic and critical thinking skills, deductive reasoning, and categorization. Individualized computer lessons. 30 minute class per week. *Class times determined according to student’s daily schedule by Area Director. This studio is open to all levels, including the very beginners. We will start by learning to chain, then single crochet stitch, and work our way towards building a scarf for the winter season! Contact Nicole O'Rourke directly at 541-531-3303 with any questions regarding the class. We provide a variety of fun and challenging activities, like earning badges, selling cookies, going on exciting field trips, exploring the outdoors, and doing community service projects. 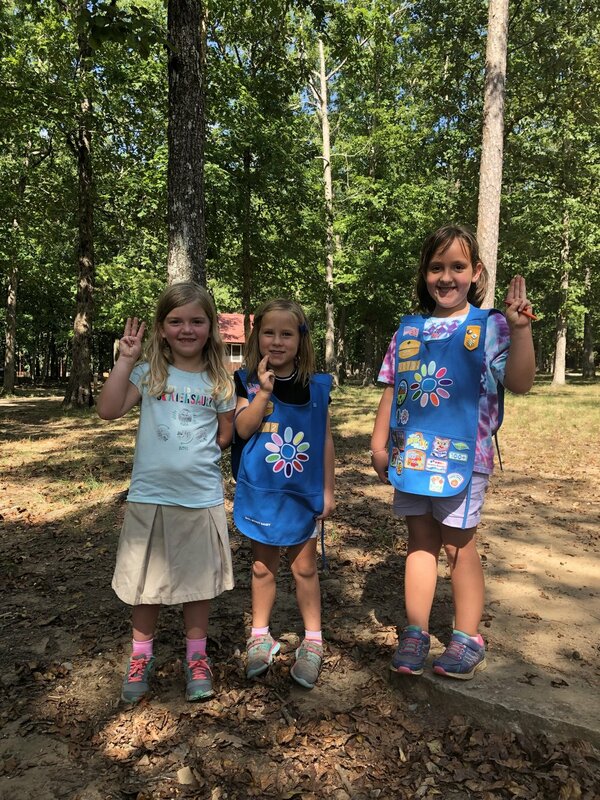 We focus on character development and leadership skills for the Daisy, Brownie, and Junior level girl. Have fun decorating your cupcakes and eating them too! Students will enjoy edible art by using new methods and designs on their cupcakes each week! Intramurals sports are designed for students at our school who want to play a sport for a month for fun. Our intramural program allows students to experience a variety of physical sports and games that contribute to an active and healthy lifestyle. Exposure to new sports and games creates a sense of belonging with their peers, improved self-confidence, and can inspire a love of a new sport. Green's Karate offers a traditional karate program. After stretching, students learn traditional stances, blocks, and katas, as well as our unique combination and counter attack techniques. We teach our curriculum through drills and edifying games that heighten the students’ awareness and increase their reflexes, coordination, and balance. Throughout the class, especially during the end of the class discussion, we focus on improving manners, respect, and self-discipline as well as self and community improvement. **Green's Karate has decided to offer a special opportunity to our TMS parents. Our parents can sign up for this studio also! Green's Karate has successfully incorporated parents and children in class together for 20 years now, and it is a very unique way to bond with your child. The cost for parents is half the cost of your student. These weekly classes are action-filled for Preschoolers and Kindergarteners full of energy. Children will sing, chant, move, dance, listen, and play simple instruments. 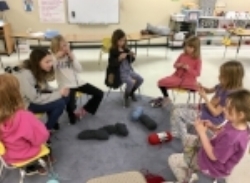 All activities bridge the natural connection between love of the outdoors, music, and movement while building beginning music literacy and singing skills. Each lesson features movement activities for coordination, body awareness and control, exploration of space, and simple instruments such as rhythm sticks, jingles, rattles, drums, and resonator bars. Don’t let screen time have a MONOPOLY on your gaming experience or you’ll be SORRY! Why RISK going through LIFE without ever having a CLUE how to YAHTZEE or sink a BATTLESHIP. This studio will offer age appropriate games (even advanced strategy games for the Middle Schoolers). Come have fun the old school way! Razaroo’s Gymnastics is owned and operated by Kim Rasmussen, our PE teacher. It is a beginning gymnastics and fitness program designed for the younger child. Students will work on basic tumbling and gymnastics skills using gymnastics apparatus. This is a great chance to give your child an opportunity to work on their balance, coordination, fitness, and gross motor skills. Spaces are limited so please register early. The Gymnastics Studio is a self - paced beginning - intermediate gymnastic and tumbling class for students. This is a great opportunity to see if your child likes tumbling and gymnastics. Students will work at their own pace to develop skills. Skills that we will work on include: cartwheels, handstands, bridges, backbends, front and back handsprings, as well as many others. Students need to be prepared to work hard and should wear appropriate clothing that stays in place while upside down, as well as clean tennis shoes. Science Olympiad is a fun STEM competition that we will compete in this May. In this after school studio, we will work primarily on events that require teamwork practice and the engineering/building events. Contact Ian Beck directly at 423-785-6968 with any questions regarding the class. Children will dive into Spanish with food, books, games, songs, and even some art. Let the learning begin! Have your kids get ready to cook up some FUN! Our enrichment classes encourage each child to learn basic cooking skills, learn about whole, healthy foods, and most importantly, to have FUN in the kitchen! Our cooking classes are more than just fun -- they are educational, too! Our child-centered curriculum incorporates lessons on math, science, nutrition, reading comprehension, language, culture and history! We provide young chefs a unique culinary adventure, with an all-inclusive, hands-on approach. We provide all of the tools, ingredients and instruction needed to cook up a fun, delicious and healthy snack that the kids will get to taste and enjoy each class. Progressively, children will build upon skills learned in previous classes and use this talent to help their families at home in the kitchen! We also provide a copy of each class recipe for the young chef to share with the family! We offer 30 minute swim lessons. We work on freestyle and backstroke, kicking and arm movement, and freestyle breathing by rolling the head to the side. If swimmers are more advanced, we will work on diving and breast stroke. We have adults who are trained in swim coaching and teaching swim lessons to children. Toddlers will develop their sensory and fine motor skills as we create various art projects. This class will give your toddler the ability to experiment with a variety of materials while having fun!